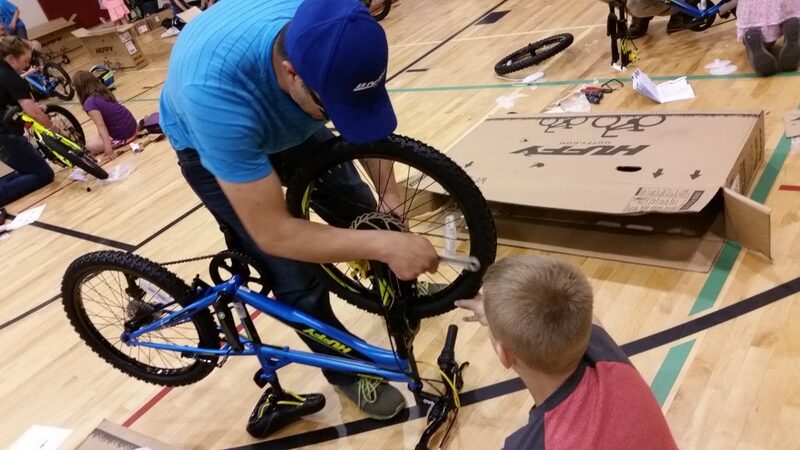 Pictured above: a BNSF employee helps a young boy in the Boys & Girls Club for Spokane County assemble a bike. BNSF employees donated 25 bikes to the club in July 2018. BNSF employs 41,000 employees in 28 states and three Canadian provinces, and employees typically stay with BNSF for a long time. The average tenure for all BNSF employees is more than 16 years. We hire employees from many walks of life, but we are especially proud of our record in hiring military veterans, who are mission-focused, skilled, motivated, and possess unique experience and technical knowledge. Currently, more than 100 BNSF employees are serving on active duty and more than 1,000 have been called to active duty since Sept. 11, 2001. At BNSF, we recognize and value the sacrifices made by our Guard and Reserve employees. We offer enhanced and extended benefits for those employees called to active duty, including make-whole pay and benefits continuation. In addition, we offer 15 days each year of make-whole pay for annual training and drill duty. In 2006, we received the Employer Support of the Guard and Reserve Freedom Award from the U.S. Secretary of Defense. This prestigious award recognizes that our policies and practices provide exemplary support for our nation’s military personnel. As a result of these commitments and more, GI Jobs magazine consistently names us one of America’s 50 Most Military Friendly Employers. We are committed to consistently enhancing the quality of life of the communities where we work and live. Given the scope of our business and our workforce, we contribute significantly to economic health and employment levels throughout the 28 states and three Canadian provinces where we operate. In many of these locations, we are among the top employers and provide competitive wages and benefits. Employee involvement in local communities ranges from generous contributions for annual United Way campaigns to coordinating local holiday toy drives. Many work teams at our Fort Worth headquarters regularly hold “service days” where they provide assistance to local nonprofit agencies. In addition to serving as team-building opportunities, these activities have benefited organizations such as the Presbyterian Night Shelter, Salvation Army, SafeHaven of Tarrant County, YWCA and the Community Enrichment Center Food Bank. Employees also serve on the boards of directors for social service and arts organizations, including local chapters of United Way, the Boys & Girls Clubs, the Arts Council of Fort Worth and Tarrant County, and colleges and universities. Every BNSF employee is subject to and trained on the company’s Code of Conduct, which focuses on ethical behavior, integrity, fraud awareness and legal compliance. Each year our salaried employees certify they agree to abide by the Code of Conduct and they understand the code, BNSF policies and applicable laws.